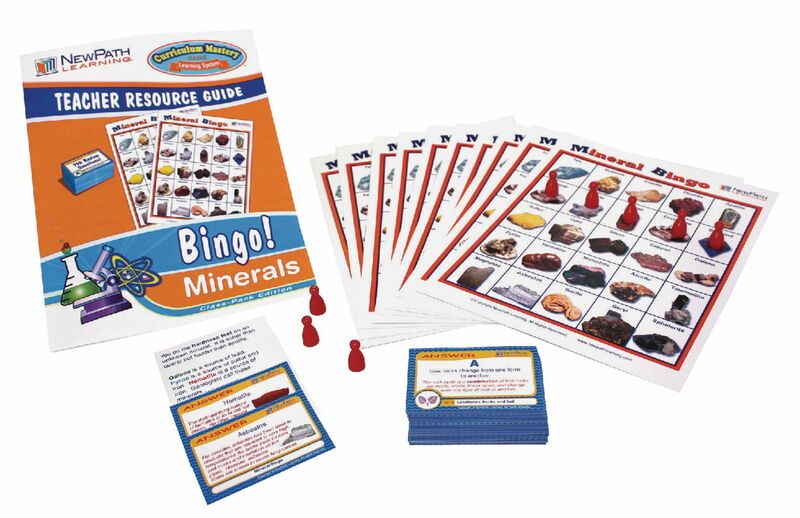 The perfect means to introduce a topic or review information covered in the classroom or lab, this Bingo game features 75 standards-based review cards. Each double-sided card includes a vivid, color photograph and key information about a mineral on one side. Included are details on the mineral's physical properties (e.g. hardness, streak, specific, gravity); special properties (e.g. magnetism, acid reaction, electrical conductivity); and common uses. The other side features a question, challenge or learning statement. In addition to the review cards, each game includes 30 full-color Bingo cards, 300 markers and a comprehensive teacher’s guide. Printed in color on durable, heavy cardstock, the cards can also be used as standalone flash cards for independent reinforcement and review.